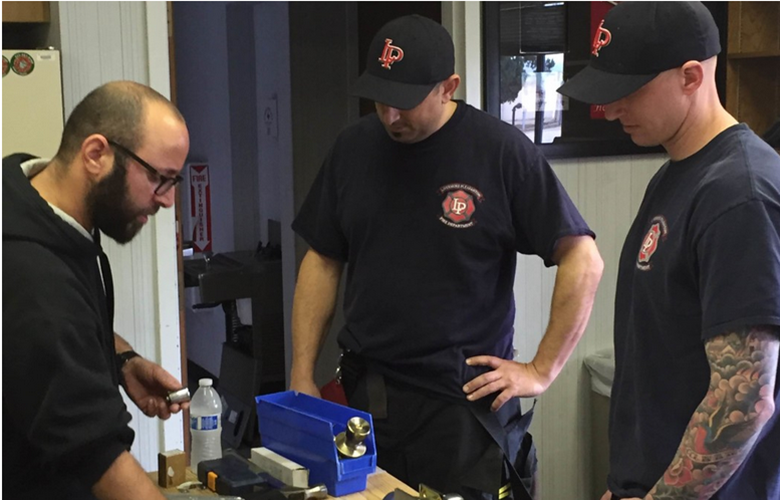 Recently we had the pleasure and opportunity of teaching a locksmith course at the LPFD (Livermore Pleasanton Fire Department) Training Grounds in Pleasanton. I didn’t even know this place existed but it’s cool. It’s set up with various structures (buildings, vehicles, large tubes that emulate tunnels, etc.) so that our Fire Fighters can train on how to put out fires in various situations. It’s used by the LPFD and also rented out to various other fire departments in the area. The San Ramon Fire Department was using part of the grounds the day we visited. Teaching this class was an enjoyable experience for us as we always relish the opportunity to be able to give to our community. Isn’t it wonderful to be able to give?! As a family, we’ve gone through our fair share of tragedy and we’ve experienced being on the receiving end. While we appreciate all the help we have received, we can appreciate even more how great it feels to be able to be on the giving side. Personally, I’d choose that side any day. Anyway, a few months back we were contacted by one of our local Firefighters. His name is Tony and he seems like a great guy. He contacted us because he’s spearheading the local effort to gain the knowledge to be able to employ less aggressive (and destructive) means of entry in certain situations. Basically, he wanted to hold a locksmith course to teach his team some locksmith skills. I have to commend him on this effort! You see, we think of the Fire Dept. responding to emergency situations (e.g. fires) in which they must gain access to the fire and possible victims as soon as possible. During these situations we don’t really care what sort of damage occurs as a result of the Fire Fighters gaining entry to the premises. However, this is actually the minority of the calls they go on. Most of the calls our local Fire Fighters deal with are for other (less emergency) situations in which brutal, destructive force is not needed nor wanted. For example, Tony related a recent call in which they were responding to an elderly woman who had fallen in her home and needed help. When they got to her front door, they told her they were going to break it down to get it. She was aghast and did not want them to do this. So, since they had no knowledge or skills to get inside another way, this woman literally dragged herself to the front door to open it for them. Then they proceeded to help her. But she didn’t want to have to pay to repair the damage (or even replace) her front door. This was a situation in which, had they possessed the tools and skillset, they could have gained access to her home (in a non-destructive easy manner) in mere minutes. There are many other times that the LPFD may be called for lesser emergency situations. Sometimes they are called to a business because of an alarm (or false alarm). Sometimes they are called to help someone who may not be in a life or death situation, but still needs their assistance. So, Tony had the foresight to call around to see if he could get some training from a local expert. When we got his call I responded immediately. What a great idea! 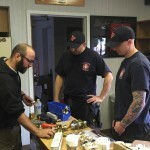 Why can’t our firefighters (or at least some of them; one per team) learn to become locksmiths as well? This is a great skillset for our Fire Department to possess. Marko led the class and gave them many tips and tricks of the trade. He’s exceptionally skilled at picking locks and has some cool (and simple) tools to help him get the job done. He went over commercial and residential entry scenarios. The guys were all interested in learning about this stuff; especially Tony. He’s going to take the lead and gain the most knowledge about this as possible on his team. We gave him some of our old locks (we recycle them anyway) and a set of pick tools so he and his team could play around. This is how it starts. We’ll see what sort of progress Tony is able to make within the next several months. We look forward to returning sometime in the next several months to see the progress firsthand and help them further with their entry skills.